Vinyl flooring is becoming an increasingly popular choice for homeowners, especially in kitchens and bathrooms. For those that are working on a budget, vinyl is an affordable yet stylish option, and there are several benefits of using it in your home. The primary reason why many people tend to use vinyl flooring for bathrooms and kitchens is that vinyl is a waterproof material. Therefore, you won’t need to worry about water soaking into the flooring and damaging it. Stain resistance is useful in kitchens, making it easy to clean up any spilled food or drinks. Another huge advantage of vinyl flooring is its sheer durability. Designed for longevity and noise reduction, vinyl is the perfect solution for households with children and pets. Another huge advantage of vinyl tiles is that individual pieces can be easily replaced when they are damaged. 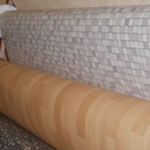 If properly installed and maintained, vinyl flooring can easily last for more than 10 years. If you wish to install your vinyl flooring yourself, you should make sure that there is a perfectly smooth surface before installation. If this isn’t the case, any flaws and imperfections will show through as bumps in your vinyl floor. If you aren’t planning to install the vinyl flooring yourself, you can utilise our installation service if you are based in Peterborough. To find out more about the benefits of vinyl or to view our array of vinyl flooring options, don’t hesitate to get in contact with our friendly team today. You can call us on 01733 553 565 or fill out a contact form and a member of our team will get in touch with you.